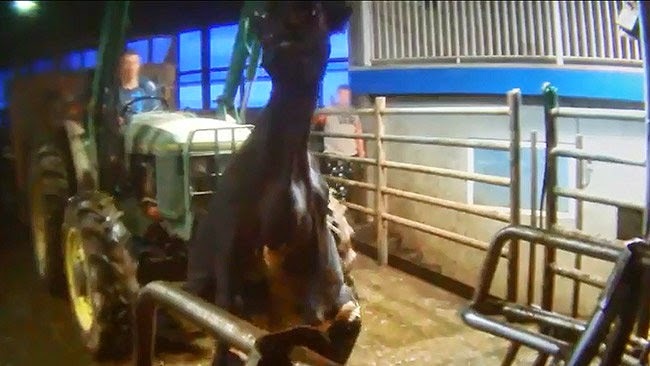 RAISE UR PAW NEWS: DAIRY FARM HORROR -- Humanity at it's Worst. DAIRY FARM HORROR -- Humanity at it's Worst. So many believe and think that all dairy farms are picturesque - being deceived and not seeing the truth that lies behind closed doors of some. We take you to a dairy farm in Chilliwack, BC where a haunting and sickening video appeared of the brutality and cruelty that cows endured by inhumane workers that found their barbaric actions amusing - inflicting cruelty including the use of chains, canes, rakes and other objects to beat cows - with no sympathy or remorse for their actions. 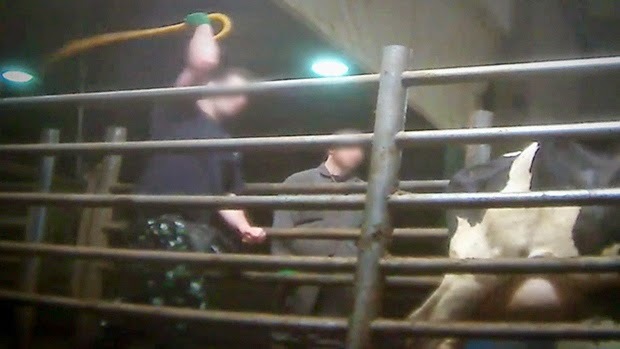 The VIDEO was recorded by an animal rights group, "MERCY FOR ANIMALS CANADA" and the media took to it quickly, shining the spotlight of the inhumanity and abuse, which shows the employees brutally kicking and punching, among other cruelty the life that resided there. 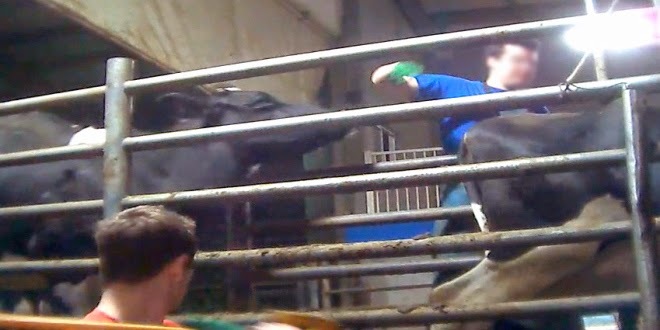 The member of the animal rights group, went undercover for 4 weeks at Chilliwack Cattle Sales Ltd and came face to face with what could only be described as "HORRIFIC ANIMAL ABUSE" - a video recorded between April 30-May 30 - listing many incidents regarding cruelty and abuse. It is clear that these "employees" have no regard for life, actions that sicken and anger so many and yet this form of cruelty is going unnoticed in so many places -- hiding in the shadows, leaving poor animals to continuously be victimized. In addition to the abuse that these poor animals go through, you can clearly see the signs of distress and injury - such things that anyone would assume that the owner of the establishment would have taken notice of -- but apparently the owner, when shown the video was shocked that this was taking place in his business. This story should open our eyes to what is happening - which should get us more involved in speaking out for animals and standing up for their rights and welfare - instead of in some way pretending that this sort of abuse, cruelty is not happening. It should also get more owners of places such as this involved in the happenings of their businesses, and create stiffer and stricter punishment for those offenders so that "0 TOLERANCE" can be fulfilled. RAISE UR PAW AND LET'S GET OUR VOICES HEARD - JUSTICE NEEDS TO BE SERVED!